Yesterday Gov. 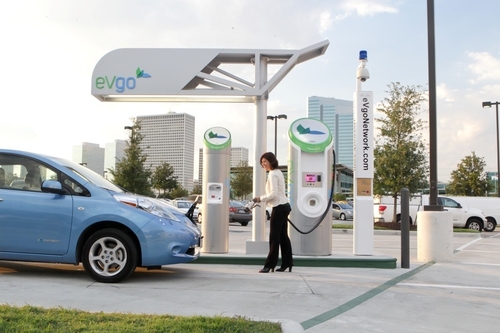 Jerry Brown announced California had settled a lawsuit with NRG, and that part of the agreement was for NRG’s eVgo subsidiary to build a large electric car charging station network. The network will include over 200 DC Fast Charge stations in California’s major metropolitan areas. While deploying electric car fast charge stations has been shown to improve EV adoption, it means California is stepping into the middle of a controversy over electric car fast charge systems standardization. This could become an expensive mistake a few years down the road. To recap yesterdays announcement, in the agreement NRG is committed to investing $100 million in building an electric vehicle charging network in California, to expand the eVgo network in that state. 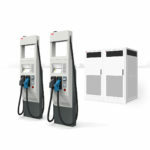 Part of the network will include “a minimum of 200 direct current (DC) fast chargers” which can “add 50 miles of range in less than 15 minutes of charging.” This specifically means that California is endorsing the CHADEMO DC Fast Charger system utilized in the Nissan Leaf and Mitsubishi i-MiEV. CHADEMO is the only system which will be available in the time-frame required by the agreement (the next four years). This may be an ill-fated endorsement of CHADEMO depending on what the SAE J1772 committee decides for electric car fast charging standards. The CHADEMO fast charging system is widely used in Japan, was developed originally by TEPCO (Japan’s electricity company) and has been implemented in electric cars by several automakers in a half dozen electric cars, including the Nissan Leaf and Mitsubishi i-MiEV. Additionally, several companies are manufacturing CHADEMO compatible fast charging systems. This is a technology in daily use in Japan since 2008, with plenty of happy users. At the Plug-In 2010 conference, TEPCO’s Mr. Anagawa presented data and experience with the CHADEMO network in Japan. Anagawa-san showed that once CHADEMO stations went into use in March 2008, electric car usage in Japan shot up dramatically. By the summer of 2010 there were already 250 CHADEMO chargers in use around Japan. This shows electric car fast charging infrastructure will spur adoption. With CHADEMO the Leaf and i-MiEV can get an 80% recharge within 30 minutes. The cars limited to the modest 3.3 or 6.6 kilowatt charge rate require a multi-hour full recharge, making those electric cars unsuitable for long distance trips. Electric cars with fast charge capability can be suitable for long trips, given existence of compatible fast charge stations. Which leads us to our controversy. 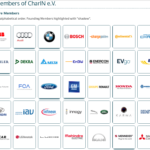 Unfortunately the automobile industry does not agree on a single fast charging standard. The SAE J1772 committee, the group in charge of electric vehicle charging standards, has refused to adopt simply CHADEMO for SAE’s DC Level 2 charging. Instead the SAE committee, led by Gery Kissel of General Motors, has a preference for only one charging port on electric cars, and CHADEMO would require two charging ports. Reports indicate the committee is unlikely to select CHADEMO but instead choose a modification to the current J1772 connector to support extra pins for DC Fast Charge. 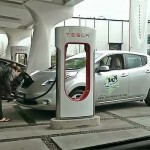 A vote is expected in July or August 2012, that may result in the rejection of CHADEMO. Additionally the fast charging territory is even more complex, because Tesla Motors (bless them) have gone and designed their own proprietary fast charging system that’s incompatible with both CHADEMO and the system favored by the SAE committee. What’s the current status of fast charging plans by different automakers? 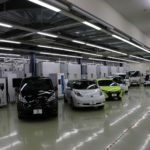 Nissan and Mitsubishi have chosen the CHADEMO standard, and are currently selling one electric car apiece, in the U.S.A., using that standard. Nissan, interestingly, has been chosen to provide Leaf electric cars for an electric taxicab pilot project in New York City. This will lead to deployment of electric NV-200 vans as electric taxicabs . Taxi service seems ideally suited to fast chargers, so the taxi’s stay on the road for more hours of the day. Is NYC also endorsing CHADEMO? 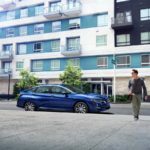 Ford and Coda are using a J1772 port running at a 6.6 kilowatt charging system, which both companies tout as twice the charging speed of the Nissan Leaf. In truth it’s only an advantage if the Leaf owner cannot access a CHADEMO compatible DC Fast Charge station. Tesla Motors has taken a proprietary go-it-alone approach. The charger connector on the Tesla Roadster, Model S and Model X is incompatible with even J1772. Tesla’s on-board charger on the Model S and X supports either 10 or 20 kilowatt charging rates, even faster than the 6.6 KW rate touted by Ford and Coda. Additionally Tesla’s system supports what that company calls a “Supercharger,” a fast charging system incompatible with both the CHADEMO design and whatever will come out of the SAE J1772 committee. Tesla apparently plans to begin installing a network of Supercharger stations beginning this summer. Nissan issued this statement praising Gov. Brown’s decision: “Nissan applauds California Governor Brown’s clear vision and strong commitment to electric vehicles through the $120 million investment for the creation of the Electric Expressway. California is leading the way in fostering the growth of electric cars, such as the zero-emissions Nissan LEAF. More than 40 percent of the 11,000 LEAFs sold in the United States are on the roads in California. Today’s landmark commitment, which will bring more than 10,000 electric-vehicle charging points to the state, paves the way for widespread adoption of this critical technology.” What Nissan didn’t say is that the decision to install CHADEMO DC Fast Charge systems helps Nissan (and Mitsubishi) at the expense of other car makers and their choices for fast charging connectors. Obviously fast charging availability will make electric vehicles more attractive, and on that level California’s decision to endorse building a network of fast charging stations is a good thing. But it means California is endorsing CHADEMO in a big way, putting California at risk of having made the wrong decision. At the same time the delays by the SAE J1772 committee have hindered adoption of todays electric vehicles, because the lack of fast charge stations is less attractive to electric car buyers. CHAdeMO, Fast Charging, NRG settlement with California, SAE DC Fast Charge. Bookmark.